My Name is Tom, I bought a horse from you about a year ago(Titleist in the Rough) as a two year old, this animal was everything you guys said he was, we have been all over Ohio trail riding and he is doing great. He will go anywhere you point and loves to be around people and kids, Just wanted to tell you thanks for a great horse. without seeing or riding them...and each one is exactly what Carey described. Hello! I'm Meredith, my mom's Amy. About three years ago, you sold us a TWH/QH cross named Buddy. He's a blood bay and about 15.2 hands. I know you sell a lot of horses, but this is the one you sold me. And I just wanted to let you know, he has been one of the best horses ever. With the help of my trainers I have taught him to trot, and we have competed in the hunter ring, and won a champion ribbon every time. We have recently begun eventing, and he has also been phenomenal with that as well. We competed at a Pony Club event, and won first in our division there. We have jumped 2' 4'' and he has plenty of potential to go higher. I have also competed in trail competitions on him, and done well. I continually receive compliments on how well behaved, and how well trained he is. We can put anyone on him. A six year old comes out and rides him ocassionally, along with one my teenage friends who has never ridden before. He is always checking on me during trail rides, and we have had very few bad incidents. So, the point of this email was to ask for your email address so that I might thank you properly and send you some pictures of all that we have accomplished. Thank you for this wonderful horse! Hey Mr. Hughes this is Carol Frances! I just wanted to let you know that I love Geronimo. I have changed his name to Joe. He is awesome. We recently went on our first field trial and Joe did great. He was one of the best mannered horses there. Thank you so much! I love Joe sooooooo much! I could not of dreamed of a better horse. him if you had birthed him yourself... LOL... he is a lapdog... we have been on our first trail ride together and he took care of me like a hero. I am forever indebted to you... thank you so much and if it is alright I will include some pictures in the very near future of us on our	trail rides. God Bless you all and keep up the excellent work! him, and can ride him with confidence anywhere. We trailered down to a Florida Greenways near our home last Sunday, and rode for about 3 hours, and he did great. We will be riding in a very big ride coming up this Saturday, but I don't expect any problems from him. My old walker, yes. I had to buy some Quitex to calm him down. I told someone the other day, that I'm kinda looking forward to my old guy crossing over that rainbow bridge so that I can buy another horse from	you!! Your recommendation of Doc was right on, and we are so very happy with him. He's got a forever home here with a 12 year old girl! She had the best Christmas ever (her words!). Good evening, I was thinking about you and wanted to let you know about a winter ride today. I don't ever get to ride in the winter because of the ice around here. I really never had friends to ride with until I met this wonderful group this past summer of 2009. Seven of us went out today. It was deep snow, slippery, sun shining, and gorgeous. I have no idea about Diego's background with this kind of weather, but I have to tell you, he was absolutely WONDERFUL. We hadn't ridden in 2 months. He was so happy. Totally enjoyed himself. Perfect behavior. I sometimes can't get over what a wonderful horse I have. And I want you to know this. Could I possibly ask for more ???? Jacinta, Vermont - I'm loving Diego more and more. I rode him 13miles Saturday and seven today. I even took him into the lake. Nothing bothered him. We crossed streams, slid down banks, crossed bridges, and encountered assorted wildlife. He was great! Please feel free to use me as a reference anytime. I couldn't be more satisfied. He is loved by everyone he meets. I've had Diego 3 years now and love him more and more. out. He is so safe and sound. What a dream! "I purchased a wonderful horse named Nugget from Carey and Terry. He is the sweetest, gentlest horse on the planet. He is everything they said he was. He stepped off the trailer as calm as a cucumber and looked at as if to say, 'Are you my new mom now?' So far I haven't found one thing that Nugget does that is bad. He's just as close to perfect as a person can find. I truly think he is actually a big Golden Lab with hooves. Thank you for allowing me to buy this wonderful horse." Brenda has since bought 29 more horses from Carey & Terry. She said, "They are all exactly as they described them!" "My husband and I purchased two horses from Carey and Terry and have been very pleased with both of them. The youngest is Max who is a TWH and is 4 years old and is wonderful. He only wants to please you and has manners that make us the envy of all my horse friends. And, on top of that, he is absolutely gorgeous too. The other horse we purchased from Carey quite simply has the smoothest, best gait I have ever ridden. Anyone who watches him immediately knows he is something special. His headset and his way of going are perfection. We were able to go look at the horses before we purchased them and I can tell you they looked and behaved exactly as they were described. Both horses were in excellent condition and were obviously extremely well taken care of. If we were currently looking for another horse or if one of our friends were looking for a horse, I would immediately call Carey. 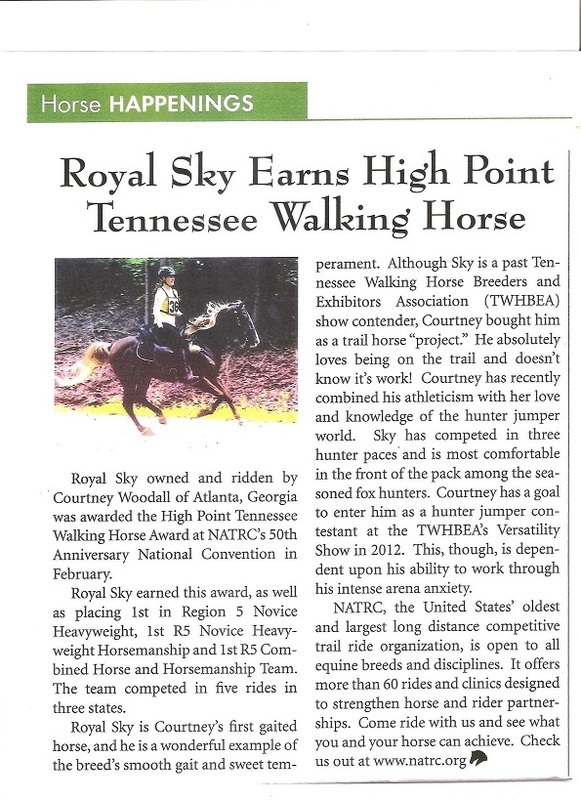 We had looked for a TWH horse for my husband for months and had even driven to Tennessee and Georgia in the process but hadn't been successful. At Carey's our problem was ...we couldn't choose. We found two horses that we loved...so long story short...we ended up purchasing both...which is the best decision we could have made. Carey and Terry were extremely helpful to us and answered any and all questions we had, even after the horses were purchased." Marty and Roni, California - "Chief has made my wife happier than I'd hoped. To quote her 'He is a very special horse' and 'He's EXACTLY what I wanted, but was afraid I wouldn't find' and 'He's a better horse than her other one'. Losing her horse was a very big loss to her. After searching the web, I saw your ad for the horses that you had at that time. All three sounded like very good prospects for her. I bought a plane ticket and flew out after you promised me that you would hold all three until I arrived. thanks also and says you can rent out his room, cause he's never coming back. " The horse pictured in the article below was purchased from All Lit Up Farm. We accept cash, wire transfers, PayPal, or cashier's checks as payment.